On An Overgrown Path: A crass and insensitive Peter Grimes? A crass and insensitive Peter Grimes? I went to see Peter Grimes last weekend and hated yet another expressionist production where the director's vision took precedence over the work. (Production shot above.) How can the English National Opera, of all companies, mess up Peter Grimes? 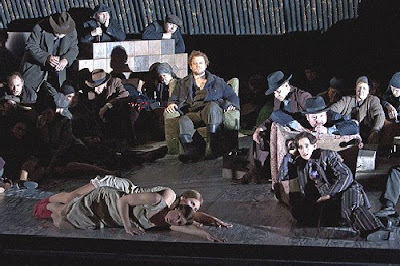 Peter Grimes and ENO is one of those combinations where tradition and context matter. The last version I saw there was gripping, but this one was just crass and insensitive. This gets me upset at two levels. First, I'm so tired of the expressionist rut that the opera world seems to find itself in. We now have a tradition that's as hidebound as the old one, but without the advantage of history. I'm not actually anti-interpretation, I've seen plenty of weird productions that I liked (Richard Jones' Ring, for example), but if you're going to mess with the rules, you'd better be great (oh, and getting the singers pointing in the right direction is good too). In the meantime, I don't need every last sub-text to be telegraphed by writhing (we're not stupid, you know)--and I propose a ten-year ban on Nazi leather greatcoats. Second, I'm wondering what happened to the spirit of Sadlers Wells? Solid productions at a price that "ordinary" people can afford? The ENO seems to be still trying to sustain its glory days in the '80s when it put Covent Garden to shame, but now the Royal Opera is doing great work, as are the regional companies. You can't be an iconoclast for ever, and I've been to too many ENO productions (e.g. Rheingold) where I had to stop watching. I think there is a remit for unpretentious, affordable opera that takes the work seriously--and that doesn't have to mean dull. If you can't make Peter Grimes gripping straight off the page, then you don't deserve to exist. One final snipe. Most of the critics loved the production (and there were some good ideas, like the opening), but I think they should get out more. In particular, they should try sitting upstairs occasionally, to judge how well a production carries and the strength of the audience. The ENO audience is strikingly homogenous, and I think that's a symptom of something. In the end, I can't tell if this is just me that's fed up, but I don't think it is. This email arrived from Steve Freeman. It chimes with my own thoughts on the new English Touring Opera's Magic Flute which I saw, coincidentally, at Snape. But like Steve I am not anti-interpretation, and was very moved by Glyndebourne's new Hänsel und Gretel. The question 'Whatever happened to the original spirit of Sadler's Wells?' is particularly relevant as this company gave the premiere of Peter Grimes in June 1945. Reginald Goodall was the conductor, the story is here. Grimes seems like an odd choice for the sort of production described in the review to which you linked. Grimes seems about as firmly grounded in (tied to?) time and place and society as any other opera with which I''m familiar. And to present "he (Grimes) and Ellen as the only characters not palpably perverted or mad" seems to me to ignore one of the major sources of the drama in the opera. If someone is the only sane individual in a mad universe (even a universe as small as the Borough), it's not hard to grasp him being driven over the edge. However, much of the power of the opera derives from the reality that the villagers are not exceptional. Certainly they are subject to the all-too-common prejudices and less than admirable actions to which we're all susceptible, including the sometimes stifling conventions of small-town life. However, it seems to me that it's their very "ordinariness" that is the basis of the dramatic tension between them and Grimes. They do not understand him and won't try (Ellen and Balstrode aside). The approach described would also seem to make nonsense of the final scene where Balstrode advises Peter to sail until he loses sight of land and then sink his boat. "Good-bye, Peter." It seems to me that the degree to which an opera or play is seriously and firmly grounded in a particular time, place, or society should act as a severe constraint if one is looking for a convincing and dramatically coherent production. For a contrary example, take Magic Flute. I have no problem envisioning "non-traditional" productions there. But Grimes?? Two things struck me later about the production. One is that if all the principles are so deeply flawed, then Grimes is just another crazy and it's hard to engage with that. The other is that in a small place like that, everyone would have known each other from birth, so exclusion would have been even more powerful. The director had a conceit about treating the chorus like a shoal of fish, which is clever but I think misguided since it anonymises them. This isn't an opera where everyone should be an archetype. The scene with Bulstrode, Grimes, and Ellen worked, because there were just the three of them on stage, but then everyone else arrived to finish it off.